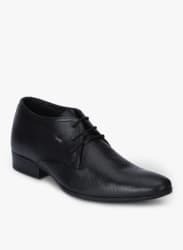 Step out in style with this pair of formal shoes by Lee Cooper. Let the sun go down for uncomfortable formal shoes, opt for this pair of formal shoes that is crafted using comfortable pu sole. Pair these formal shoes with a shirt and trousers to look absolutely handsome.